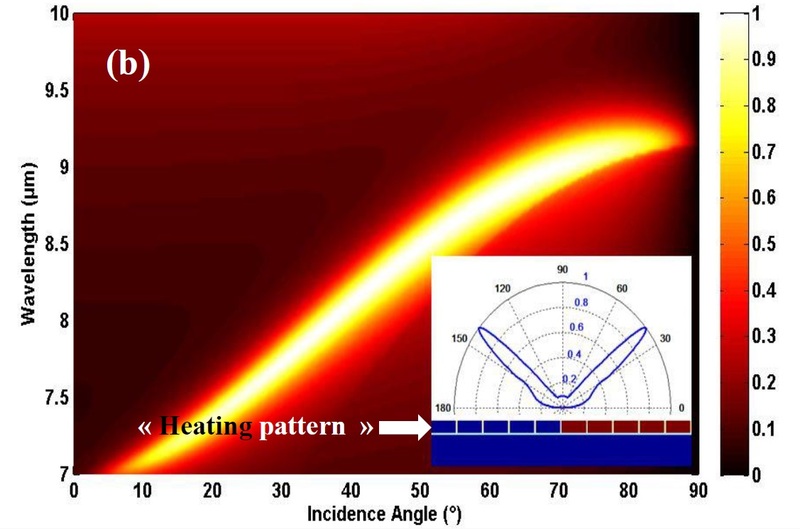 Based on the thin film coating and structuring of metal oxides, this innovation can provide a directive IR emission with radiation rate control. The necessary time to switch from one functioning mode to another is around one microsecond. For a given angle, low range infrared emission spectra in which the mean frequency could be easily controlled by changing the period of surface grating cf Figure (b) and Figure (b’). 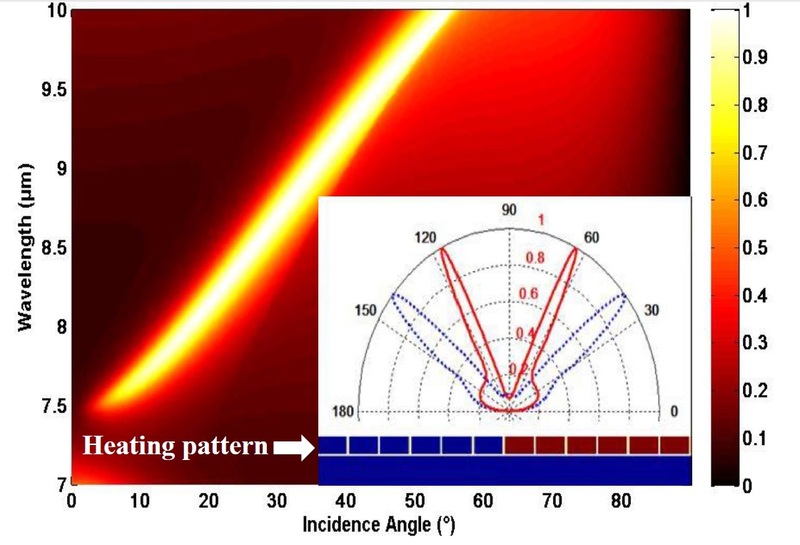 For a given wavelength, the emission angle could be easily controlled through the period of surface grating cf Figure (b) and Figure (b’). Reversible microsecond switching from one functioning mode to another. This functionality could be used to control the heat transfer and radiation rate. 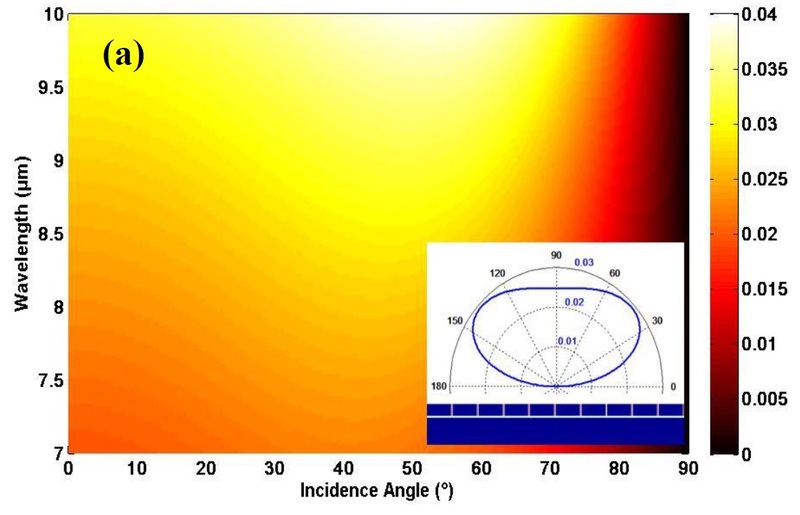 Figure : TM-polarized emissivity of the VO2-source in (a) its purely crystalline (dark blue) non-emittingphase and (b) in its hybrid (crystalline-amorphous) phase where the amorphous phase forms a surface grating of period P = 4.5 μm (10 unit cells of 450 nm length each) (b’) in its hybrid (crystalline-amorphous) phase where the amorphous phase forms a surface grating of period P = 5.4 μm (12 unit cells of 450 nm length each). The inset shows the structure of one period of the source and its emission pattern at 8.5 μm. Promising results were obtained using computer simulation. No difficulties of production were pointed out. A demonstrator could be provided during the first semester of 2015. By coating and structuring the surface of heat sources the IR emission of these surfaces can be controlled. Applications such as heat management in satellites and flip-chip/ 3D packaging are possible. For these applications, better heat management can open the possibility for a more compact integration.